Gossip Girl is coming to an end on 17th Dec and so I wanted to post about my favorite outfits from the past seasons. It was really difficult to choose as the fashion in every episode is out of the world!! 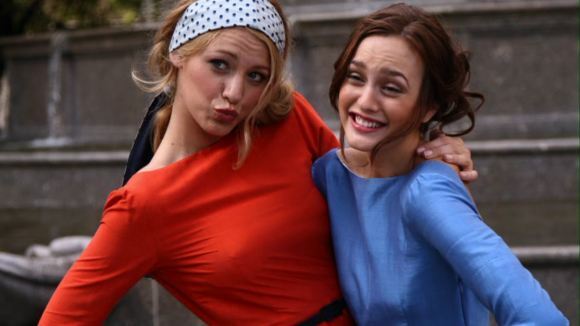 Blair and Serena's photo shoot around Manhattan. I don't know the designer but I love this look and the episode. Looking at Serena and Blair go around Manhattan in matching backless dresses clicking pictures with the soundtrack "Beautiful Girls'' by Sean Kingston made me wanna grab my best friend and jet off to NYC. This is from the last episode in season 1 from Lily and Bart's wedding. I really liked Serena's Ralph Lauren Ruffled Fillipa dress. The gown is different from the ones we usually see on Serena and it went perfectly with the theme of the whole wedding, also the addition of the black lace gloves took the whole look to the next level. The first episode of the second season in the Hamptons. The White party surely made me wanna go to Hamptons for the summer. I loved the white Oscar De La Renta Spring 2008 white gown worn by Blake Lively, the hair and the accessories were divine and make the whole look. I loved the Marchesa Spring 2008 dress worn by Leighton Meester in this episode for the prom. I also loved the story about how it matched the dress in Blair's scrap book and Chuck gets it for her from Paris. The tulle with the gorgeous embroidery and a jewelled headband made this a memorable outfit. Blake Lively wore a beautiful lace dress by Stella McCartney and totally rocked the look. The statement earrings by Simon Tu and the open hair made the look effortless.